Any further information on these men will be gratefully received. Information on the current ringers can be found on the church’s own page about the bells and on the Surrey Association website. It also appears that a list of men of the parish serving in the forces was created during the war is now held by Sutton Archives. This may help shed further light on the Beddington men. 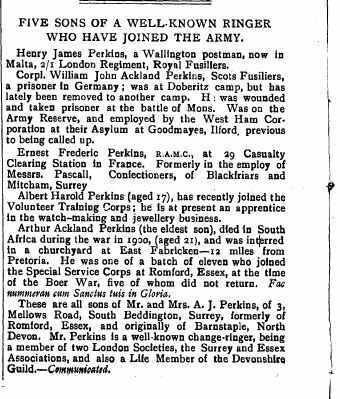 Also come to light is a brief article about the five sons of A J Perkins who have served in the army (including one killed in the Boer War). This reproduced in full below, thanks to the editor of The Ringing World for permission to use such extracts on this blog. Bell News, 18 December 1915, page 123. A son of the rector was also killed, and this was marked by halfmuffled ringing by the Beddington ringers (with assistance from Croydon ringers) in July 1917. Reported in The Ringing World of 3 August 1917. Private Willoughby E Maulden of Framlingham also rang in a quarter peal of Grandsire Caters at Beddington on 1 July 1917 while serving with the ASC at Lee Green 9he had also been elected to the London County Association at Mortlake).